Tech aficionados, analysts and industry insiders had long argued that it was only a matter of time before Xiaomi surpassed Samsung’s market-share in India, and that’s exactly what seems to have happened now with the Chinese company believed to have become the largest smartphone vendor in the country. According to a report from Canalys, Xiaomi garnered a 27% share of the Indian smartphone market in Q4 2017, shipping almost 8.2 million smartphones during the quarter, while Samsung came in at number two with around 25 percent market-share and 7.3 million units shipped during the same period. The two companies were believed to have tied for the top spot during the third quarter of last year with 23.5 percent market-share apiece. According to Canalys, Xiaomi’s success can be attributed to its increased presence in the offline sector, as well as its growing clout in the all-important lower mid-range segment (sub-Rs. 15,000), where the company has had multiple blockbuster products during the year, including the Redmi Note 4 and the Redmi 5A. Canalys analyst Rushabh Doshi said that “despite its ability to offer better margins and funding to the offline channel, consumer demand for Samsung’s devices has been weak”. 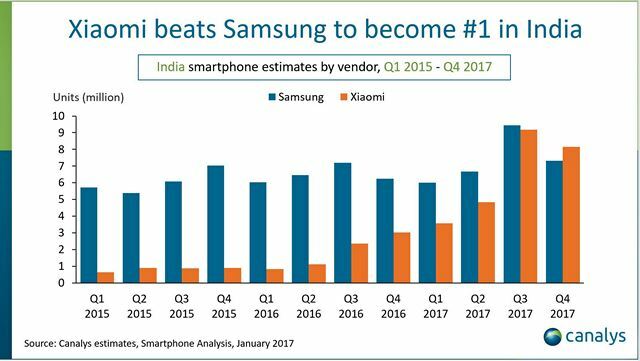 He added the Samsung-Xiaomi battle for mid-range supremacy in India is only just starting, and “will continue well into 2018, as Samsung revamps its low-cost portfolio and fights to take back the aspirational status it once held in minds of Indian consumers”. Curiously, though, Samsung is disputing Canalys’ assertion that Xiaomi is now number one in the second largest smartphone market in the world. The South Korean tech giant has released a statement, where it cites a recent GfK report to claim that it is still India’s top smartphone company “by a distance”. The following is an excerpt from Samsung’s press statement: “As per GfK, which tracks sales to end consumers in the last (November) quarter Samsung had a 45% value market share and 40% volume market share. Samsung is a full range player and leads the smartphone business across every segment of the India market in 2017”. Meanwhile, the Canalys report also says that the overall smartphone market in India grew by just 6% during the quarter with almost 30 million units shipped. Vivo, Oppo and Lenovo are said to be holding firm at numbers three, four and five respectively.